Logging in Ulu Muda Forest Reserve: Is Penang’s Water Security under Threat? Forests cover more than half of Malaysia’s total land area (59.5%). They are the source of many major rivers that supply fresh water to the different states, and serve at the same time as water catchment areas. The Ulu Muda Forest Reserve, located in Kedah, is an important water catchment area supplying raw water to Penang, Kedah and Perlis. Around 80% of Penang’s raw water supply comes from its Muda River. The river also accounts for 96% of Kedah’s water supply and 50% of Perlis’. Furthermore, the Muda irrigation scheme in Kedah, which accounts for about 40% of the country’s total rice production, also relies heavily on water sourced from the same river. The Ulu Muda region is therefore a vital site for the environmental well-being of the Northern Corridor Economic Region (NCER). However, the rampant logging taking place in the water catchment area has been a source of distress for Penang. Politicians, governmental and non-governmental agencies, and the state’s water service provider Perbadanan Bekalan Air Pulau Pinang (PBAPP) have all raised concerns about how the excessive logging by Kedah-licensed operators may seriously affect the quality and quantity of the Muda River’s waters. Hence, effective measures need to be enforced to ensure the continued sustainability and biodiversity of the forest reserve. The Ulu Muda Forest Reserve (105,059-hectare) is one of the seven forests (and the largest) of the 160,000 ha Greater Ulu Muda forests. The other six include Bukit Keramat Forest Reserve (10,226 ha), Padang Terap Forest Reserve (12,958 ha), Pedu Forest Reserve (15,299 ha), Chebar Besar Forest Reserve (8,827 ha), Chebar Kecil Forest Reserve (1,184 ha), and Bukit Saiong Forest Reserve (8,191 ha). As mentioned, the Muda River supplies water to Penang, Kedah and Perlis. 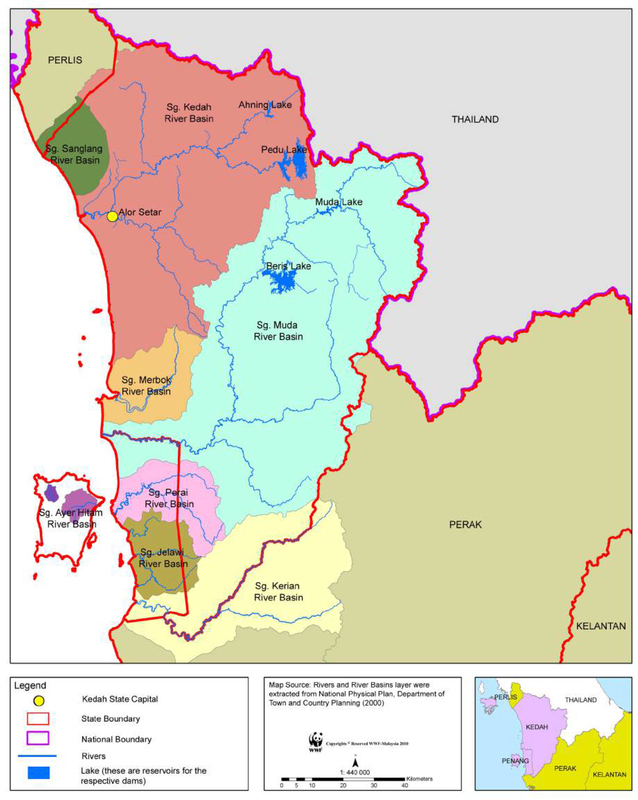 The upper and middle reaches of the river belong to Kedah, while the river downstream acts as a boundary between Kedah and Penang, giving the latter the right to draw water from it (Figure 1). The three man-made dams Muda, Pedu and Ahning, through which the Muda River provides water, are responsible for the aforementioned states’ water supply, while the Beris dam, also within the Muda River, is solely responsible for supplying water to Kedah. According to a 2009 World Wildlife Fund study on the Economic Benefits of the Muda Water Catchment, only five out of the seven forests have been gazetted as Permanent Reserved Forests (PRFs) for both production and protection purposes by the Kedah state government under the National Forestry Act 1984. These are the Chebar Besar Forest Reserve, Padang Terap Forest Reserve, Pedu Forest Reserve, Chebar Kecil Forest Reserve and Ulu Muda Forest Reserve, forming a total area of 143,327 ha. 64.5% of the five PRFs are gazetted for timber production, 32.3%for water catchment and the rest for research, education and recreation. The percentage breakdown thus indicates that only a low fraction of the forests’ areas have been gazetted for water catchment, and the importance of the Ulu Muda Forest Reserve as a major water catchment area for the NCER remains unrealised by the state government. Apart from being a predominant water catchment area for the northern Malaysian states, Ulu Muda Forest Reserve also boasts a rich biodiversity of flora and fauna. Thus far, an estimate of 31 wildlife species has been spotted. These include Asian elephants, leopards, Malayan tapirs and the sambar deer. The reserve is also popular among avid birdwatchers for its varied bird species, and is one of the only two sites in Malaysia where all 10 Hornbill species can be found. Another unique feature that makes the forest reserve conducive for wildlife population to thrive is the presence of natural salt licks. Salt licks are identified as areas containing salt or other essential minerals that are important for the well-being of wildlife, particularly herbivorous mammals and birds. The rainforest has strong potential to become an international ecotourism site. But for this to be possible, comprehensive biodiversity and ecological surveys and studies must first be conducted. A thorough understanding of its unique features and the many wildlife species it harbours may well precipitate the implementation of effective protection and conservation efforts to transform the Ulu Muda Forest Reserve into a world-class ecotourism site with extensive biodiversity values. Despite having a good water management system in place, Penang still has serious water concerns to contend with. As one of the most important manufacturing hubs in the region, Penang’s manufacturing industry contributes significantly to the state’s overall gross domestic product(GDP). But to keep doing so,the industry requires sustainable water supply. Insufficient or unreliable water supply may otherwise result in revenue losses to all parties concerned. To become a high-income economy state, Penang therefore needs to sustain a continuous supply of water into the future. Additionally, the state is experiencing significant population growth, and further urbanisation and rapid land developments will inevitably increase the demand for water supply. Currently, the state’s per capita domestic water consumption stands at 286 litres, the highest in Malaysia. It is very likely that in the future, the demand for water will continue to rise to accommodate Penang’s expanding population. The importance of sustainable and affordable water supply to the state therefore cannot be stressed enough. However, rampant logging activities taking place in the Ulu Muda Forest Reserve is jeopardising the water supply to Penang. Datuk Ir. Jaseni Maidinsa, the chief executive officer of PBAPP, estimates that the whole water catchment area of the rainforest would be completely logged in 12 years if Kedah does not take immediate measures. He also urges Kedah to provide further clarification on the facts and figures about logging in the forest reserve. In 2003, the Federal Government banned all logging activities in the forest reserve after its impact assessment discovered “low impact heli-logging” to be environmentally unfavourable. But the ban did not last long. When the Pan-Malaysian Islamic Party (PAS) took over Kedah in 2008, logging activities in the area resumed as the state government needed to generate revenues. The deforestation persisted when UMNO took over from PAS in 2013. According to the 2014 Auditor-General’s report, more than 46,000 ha of land in the Ulu Muda Forest Reserve have been approved for logging between 2009 and 2014. However, the Kedah state government has denied any illegal logging activity in the area. According to Badrol Hisham Hashim, Kedah’s State Housing, Local Government, Water Supply, Water Resources and Energy Committee chairman, the logging is instead ‘being carried outside the catchment area’ and is not detrimental to the environment. Sofar, neither hydrology and dam effective capacity reports nor evidence of logging figures have been disclosed to support his claims. The Kedah state government must realise that turning a blind eye to unsustainable and extractive activities like logging in the water catchment area can negatively impact the availability of water in the forest reserve. Deforestation will cause siltation, which will reduce the capacity of the Beris, Muda, Pedu and Ahning dams to capture and store water. This, in turn, will affect the availability and quality of Penang’s raw water supply, and as water treatments can be costly, a hike in water prices is possible in the future. These undesirable outcomes may also lead to Penang tackling severe water crisis. Therefore, swift but potent measures need to be taken to protect the Ulu Muda Forest Reserve and to ensure Penang’s continued water sustainability. Goal 15 of the Sustainable Development Goals: Life on Land (United Nations Development Programme) focuses on sustainably managing forests, restoring degraded lands, combating desertification, reducing degraded natural habitats, and ending biodiversity loss. The goal stresses that sustainable development cannot be achieved if forests are not protected, as they are integral to the survival of humans. Similarly, protecting the Ulu Muda Forest Reserve is imperative for Malaysia if it aims to become a high-income country. The Kedah state government should introduce a policy banning all commercial logging and extractive activities in the rainforest as a first step towards conservation. The policy should also introduce harsher penalties for illegal logging activities to combat unsustainable deforestation. A ‘no commercial logging’ policy will save the forest reserve from ruination, and protect its natural biodiversity. Since such a ban will affect its revenues, it is advisable that the state government seek compensation from the Federal Government in lieu of forest premiums by highlighting the importance of the rainforest as a major water catchment area for the NCER. Though it covers only 7% of the country, the NCER contributes over 20% to the national GDP, as well as more than 60% of the total agricultural area for paddy growing. If water supply to the NCER is affected, Malaysia’s economy will surely suffer. As a subsequent strategy, efforts should be taken by the state government to gazette the Ulu Muda Forest Reserve as an important water catchment reserve. Protecting the forest reserve will help to reduce soil erosion and sedimentation, leading to better quality water catchments. It is also believed to be one of the more cost-effective ways of providing clean water. So far, only 32.3% of the five PRF shave been gazetted for water catchment. Given the importance of these forests, the whole of Ulu Muda Forest Reserve should be gazetted as a sensitive water catchment reserve under the National Forestry Act 1984. Once gazetted, focus should then be placed on the sustainable management and monitoring of the forest reserve’s natural resources through education, biodiversity research, and sustainable ecotourism. Attention should also be given to initiate a research-driven conservation programme in order to transform the water catchment reserve into a research hub for local and international scientists and students to carry out ecological and biodiversity surveys and studies. This will further strengthen Ulu Muda’s role as a rich biodiversity site with extensive environmental services. Finally, forest restoration and rehabilitation programmes involving local communities and NGOs should be introduced by the Kedah state government as a way to restore and protect the rainforest. These programmes require long-term planning, implementation and monitoring, and should involve different parties. Such restoration and rehabilitation typically involve protective measures (fire protection and/or erosion control), tree planting initiatives, and natural recovery accelerating measures(through seeding degraded forests). In order for these programmes to be truly successful, full cooperation from different stakeholders is required. It is important to realise that the Ulu Muda Forest Reserve is not just Kedah’s problem as it serves the other NCER states as well. Therefore, Penang and Perlis should provide continuous support to assist Kedah in protecting the forest reserve. Achieving water security is paramount for Penang if it is to become a high-income economy state. The state’s heavy dependence on the Muda River as its major water source is risky; it has been estimated that the Muda River can only support Penang’s raw water needs until the year 2020. Furthermore, the demand for water is also expected to rise in tandem with increasing land developments, especially with the new housing developments in Seberang Perai. It is evident that there is a real need for more reliable and secure water sources. The Perak River has been identified as a potential raw water source for Penang to ensure long-term water sufficiency (until 2050). However, since the Federal Government has delayed the implementation of the Sungai Perak Raw Water Transfer Scheme (SPRWTS), Penang, in the meantime, must seek other alternatives such as rainwater harvesting, water recycling and desalination to ensure continuous raw water availability. Technologies such as water recycling and desalination will no doubt increase the cost of Penang’s water supply, but this is the price the public will have to pay to avoid water rationing and to attain water security in the future. Effective water demand management measures and strategies including public education and awareness about water conservation, promoting the use of water-saving devices in households and offices, and increasing Penang’s water tariff will further help with water conservation and direct Penang towards achieving long-term water sustainability. PBA, 2017. Ulu Muda: Kedah should clarify the truth about logging (Press Statement): http://www.pba.com.my/pdf/news/2017/09052017_PBAPP_Kedah_Should_Clarify2.pdf. The Star, 2017. Home users the main guzzlers. (28 April 2017) Accessed on 12 August 2017: http://www.thestar.com.my/metro/community/2017/04/28/home-users-the-main-guzzlers-ceo-domestic-water-usage-in-penang-higher-than-industries/. The Star, 2017. ‘Logging in Ulu Muda reserve should be halted’. (9 March 2017) Accessed on 12 August 2017: http://www.thestar.com.my/news/nation/2017/03/09/logging-in-ulu-muda-reserve-should-be-halted/. FMT, 2017. Yes, logging on in Ulu Muda but it is licensed. (8 May 2017) Accessed on 11 August 2017: http://www.freemalaysiatoday.com/category/nation/2017/05/08/yes-logging-going-on-in-muda-but-it-is-licensed/. UNDP. Goal 15: Life on Land. Accessed on 10 August 2017: http://www.undp.org/content/undp/en/home/sustainable-development-goals/goal-15-life-on-land.html. The Star, 2017. Penang urging Kedah to clear the air over discovery of new trail near Muda (10 May 2017) Accessed on 13 August 2017: http://www.thestar.com.my/news/nation/2017/05/10/come-clean-on-logging-in-forest-reserve-penang-urging-kedah-t o-clear-the-air-over-discovery-of-new-t/. FAO. Forest restoration and rehabilitation. Accessed on 11 August 2017: http://www.fao.org/sustainable-forest-management/toolbox/modules/forest-restoration-and-rehabilitation/basic-knowl edge/en.